Anker’s Nebula Capsule is a tiny, ultra-portable, battery-powered projector. Similar in size to a can of Coke, this projector can go anywhere, and built-in Android 7.1 ensures it can keep up with any of your media needs. Let’s take a deeper look. Measuring 4.7 x 2.6 inches, and weighing under 15 oz, the capsule is an ultra-portable, take anywhere projector. Smaller than an Amazon Echo, this little projector feels very sturdy. It has a metal tripod mount on the bottom and a series of control buttons on the top. A 5W, 360-degree speaker array handles audio, and a small wheel on the left side of the unit is for focusing. The rear of the projector houses the infrared port, and a Micro-USB and full-size HDMI port. This projector uses an FWVGA DLP sensor, with a native resolution of 854 x 480 pixels. While this isn’t even 1080p, let alone 4K, it’s a common resolution for portable projectors, and Nebula has managed to make the image look clear and sharp. This bulb will last 30,000 hours, which is an outstanding life. You’re unlikely to ever use it enough to kill the sensor. The capsule has a brightness rating of 100 ANSI Lumens. This may not sound like a lot when compared to the average of 1500 – 2500 for large home projectors, but this is excellent for a mini projector. ANSI Lumens are a standard for measuring light output. If a projector measures brightness in Lumens, and not ANSI Lumens, it’s always going to be much dimmer than you’d expect. The throw ratio of around 1:1.2 is very good, but like any projector which isn’t classified as “short throw”, it means you’ll need a large amount of room if you want to project a huge image. The focus wheel on the left can be tough to use, and it’s very loose. This can make it difficult to achieve perfect focus, but you’ll soon get the hang of it after a few uses. Powered by a 5200 mAh battery, the capsule can run for four hours. When it’s time to charge, you’ll need to connect the included micro-USB cable to your own charger. This projector houses a quad-core processor, with 1GB of RAM, and 8GB of ROM. Like many projectors, a high-powered fan keeps the electronics cool, and this does produce a loud noise, but you won’t hear it over the speaker. The customized interface lets you change a variety of settings, including Keystone. It supports auto-vertical Keystone correction, but this never appears to work very well. The basic buttons on the top are for power on/off, volume, and mode switching. USB OTG What Is USB OTG? 5 Cool Ways to Use It on Android What Is USB OTG? 5 Cool Ways to Use It on Android What is USB OTG and how can you use it on Android? We explain the feature and the many ways to utilize it. Read More works, and through the included Micro-USB to USB Type-A converter, you can connect flash storage devices for media playback. By downloading the Capsule Control (iOS/Android) app, you can control this projector over Bluetooth with your phone. You don’t have to use this app, as the included remote control and built-in Wi-Fi allow you to run apps such as Netflix or YouTube on the projector itself. No lens cap comes included, but inside the box, you’ll find a carrying bag, remote control, and quick-start manual. The box is well designed and closes with a magnetic catch. If you don’t want to carry this projector around in the bag, you can always store it in the box. While it’s possible to control the Capsule with the buttons and remote control, its real strength comes from the control app. Like many smart TVs, fiddling about with arrow buttons and an on-screen keyboard takes far too long to enter text. The app allows you to enter text using your phone and provides an interface to control the projector. Mouse mode lets you move your finger over your screen, to control a mouse pointer on the projector. For a more intuitive control, controller mode lets you swipe and tap to navigate through apps. This app works very well and is an innovative way of control. The app connects over Bluetooth, and it can sometimes take several seconds to connect. Once connected, it generally maintains a stable and reliable connection. By using the USB OTG port, or full-size HDMI port, you can playback media in a traditional way. The real trick here is Android 7.1. By installing a variety of apps such as Netflix, Hulu, or YouTube, you can consume all your media without ever connecting a cable. All the apps work very well, but it’s a limited selection from the third-party Apptoide TV store. It’s not as limited as the paltry 11 apps available in the previous Nebula Mars Nebula Mars Review: This IS The Portable Projector You're Looking For! Nebula Mars Review: This IS The Portable Projector You're Looking For! Portable projectors generally aren't great: poor image quality, not bright enough, rubbish speakers, and barely enough battery to last a whole movie. But the Nebula Mars sets the new standard. Read More (based on Android 4.4), but still. The Play Store is not available, so it’s not possible to install unsupported apps. It’s possible to mirror your smartphone, but this doesn’t support playback of protected content (such as Netflix). You’ll need to use the built-in apps for this, or connect through the HDMI port. Image quality is fantastic, which is very surprising for such a low-resolution sensor. A 100-inch screen is possible, but only in a dark room. At smaller sizes, the output is bright enough to use even with ambient light in the room. This won’t work very well outdoors during the day, but providing you avoid direct light on the screen, it works reasonably well in a bright room. Colors look bright and vivid, and even projecting onto a plain white wall produces excellent results. Dedicated projector screens provide better results, but setting one up almost defeats the point of a portable, battery-powered projector. 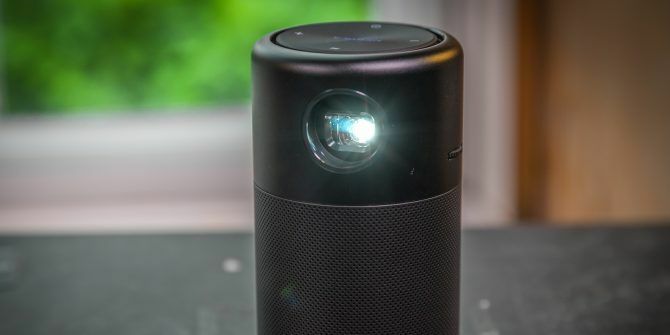 The Nebula Capsule is a fantastic portable projector. Great image quality, battery life, brightness, and easy remote control are all huge benefits. Benefitting from Anker’s outstanding after-sales support, the Capsule may be one of the best portable projectors around—but it will cost you. It’s possible to get around the poor focus control, so if you’re after a portable projector, you won’t find much better in a smaller footprint. If you’re in need of several more advanced features, the Nebula Mars Nebula Mars Review: This IS The Portable Projector You're Looking For! Nebula Mars Review: This IS The Portable Projector You're Looking For! Portable projectors generally aren't great: poor image quality, not bright enough, rubbish speakers, and barely enough battery to last a whole movie. But the Nebula Mars sets the new standard. Read More is the big brother to the capsule, and provides better performance, albeit at a much higher price and running an older version of Android. Interested in building your own home theater How to Set Up a Projection-Based Home Theater, Step by Step How to Set Up a Projection-Based Home Theater, Step by Step Watch movies on the big screen, at home, with the perfect home cinema set up for any budget. Nothing beats the big screen experience for movies or gaming, but home theater is an expensive hobby... Read More ? You’ll need something a bit bigger than this projector. Something like the awesome BenQ TK800 4K projector BenQ TK800 is a 4K Projector You Can Actually Afford BenQ TK800 is a 4K Projector You Can Actually Afford Affordable, super-bright, outstanding colors, lifespan, and screen size. This fantastic projector has it all. There's no reason not to purchase it. Read More should do the trick! Interesting and wanted to try on it. "The Play Store is not available, so it’s not possible to install unsupported apps." Is it not possible to sideload APKs directly onto the device? Android normally supports that.